As we all look forward to spring why not see the lovely sites along the Alban Way – attached is a cycle route map to follow. The highlight of course being our very own NAST HYDE HALT! WHATS ON, BUSINESS GUIDE, OFFERS, LOCAL NEWS AND UPDATES, LOCAL COMMUNITY GUIDE AND MORE…………………..
Have you joined OWL? – this is a service run by Herts Police that helps to keep communities safe reduce crime and keep local residents informed. Once you sign up you will receive any latest local crime alerts and also very useful advice for home , car and personal security. It is free to join! Hertfordshire Health Walks – organised walks right on our doorstep! Ellenbrook Fields/de Havilland Hertfordshire Sports Village Entrance, de Havilland Campus, Hatfield Business Park, Hatfield, AL10 9EU Fridays 4pm Weekly All walks are FREE and there’s no need to book – just turn up! Walks are graded between 20-30 minutes (First Steps) and 90 minutes (Grade 4), unless otherwise stated. Baby Rhyme Times are a fun half hour session of songs and rhymes suitable for babies and toddlers of all ages. There is no need to book in advance, however for the comfort and safety of you and your child, we reserve the right to limit numbers at popular sessions. £1 voluntary donation per family. Toddler Tales – Hatfield Library – Toddler Tales at Hatfield Library is the perfect next step from Baby Rhyme Time, with a mix of lively stories and rhymes for you and your child to join in with. Hatfield General Market – Hatfield General Market is held on Wednesdays and Saturdays from 8am-4pm. There are a range of stalls offering a variety of products from, jewellery, fish, fruit and veg, clothing, phones and accessories, key cutting and much more. The Park Run which is held at Ellenbrook Fields every Saturday morning which local residents may be interested in. Ellenbrook Fields is a free 5k run held on Saturday mornings in Hatfield. Open to all, free, and safe and easy to take part in. What is Ellenbrook Fields parkrun? The event takes place at Ellenbrook Fields, a privately owned nature reserve which is adjacent to the University of Hertfordshire Sports Village outdoor pitches on de Havilland Campus, Hatfield, Hertfordshire. To access Ellenbrook Fields, you can park in the main de Havilland campus entrance, off Mosquito Way and make the short walk. Nothing – it’s free! but please register before your first run. Only ever register with parkrun once. Don’t forget to bring a printed copy of your barcode. If you forget it, you won’t get a time. Ellenbrook Fields parkrun needs you! It is entirely organised by volunteers – email ellenbrookfieldshelpers@parkrun.com to help. Every week we grab a post parkrun coffee in the Herts Sports Village café, just inside THE main entrance – please come and join us! Fun weekly singing class for all abilities – come & join us at Welwyn Hatfield Community Choir! Community choir is open to all abilities, you don’t need to be able to read music, or to have sung anywhere except the bath/kitchen before. They sing material from simple rounds to show tunes to opera & everything in between. We aim for 1-2 public performances each term but no one is obliged to perform if they don’t want to. They rehearse every Wednesday of term time at Onslow St Audrey’s School Hatfield AL10 8AB. £4/week or pay “up front” £40/term & save £8. It’s that time of year again and so I’m organising a bulb planting afternoon on Remembrance Sunday 11th November down at Nast Hyde Halt and up along the old line until Deadman’s Crossing between 1pm and 5pm.We had a good turn out last year let’s see if we can do even better this year and spread the spring display further along the Alban Way. 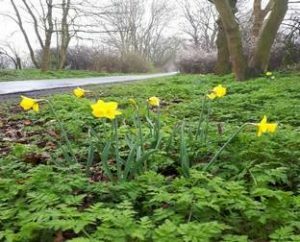 Please bring your own bulbs such as large daffodils etc which’ll come up early whilst the trees are still leafless and the undergrowth has yet to grow up…bring something to dig with too and plant your bulbs at least 2 meters away from the path edge so to avoid the old Railway ballast. Let’s do our bit to brighten up people’s lives as we drag ourselves out of the winters trudge and pay our respects to our fallen hero’s from the past and those left behind with the crippling burden of grief and upset at their loss. p.s. Thank you for the huge turn out on Halloween night to the Ghost Walk, we raised a couple of hundred pounds towards the playground fund, it was fantastic to see you all. 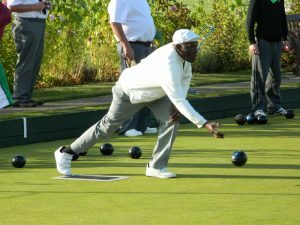 De Havilland Bowls Club – still bowling along after 80 years! If you want to know more or want to give it a try some other time, then chat to Mike Scandrett, the Club Secretary who lives in the Selwyn Crescent. He is on 01707 262750. More information can be found on their website www.dehavillandbowlsclub.org.